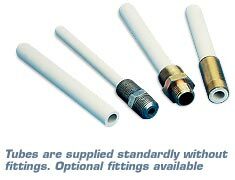 Nota: Fittings may be ordered by contacting our sales department. When ordering tube with fitting specify the fitting number (1, 2, 3) after the model number, and add $30 to the price of the tube. 118 per 1 1/8 in. 114 per 1 1/4 in.